Dr. Kressin will come to your office to provide presentations or workshops on various veterinary dentistry and oral surgery topics. Just ask and we can work out a time to share information and ideas! Some veterinary hospitals have shared workshops. Through Veterinary Medical Associations, larger scale presents and laboratory sessions can be arranged. Ask and you shall recieve! You may e-mail Dr. Kressin at Dale@VIN.com. Vest a K9 is July 15, 2017 at Milwaukee Emergency Center for Animals. Animal Dentistry and Oral Surgery Specialists, LLC will be there! You should be there as well. Several Milwaukee Brewers will be there with us! 29th Annual Veterinary Dental Forum & 13th World Veterinary Dental Congress October 29-November 1, 2015 The Portola Inn and Monterey Conference Center Monterey, CA. Dr. Kressin and Honzelka will be teaching dental extractions for veterinarians. 20015 Annual Swing into Summer Symposium : April 18, 2015 @ Raddison Hotel Milwaukee, Wisconsin. Dr. Honzelka is providing continuing education (CE credits through the Milwaukee Veterinary Medical Association) for veterinarians. A Simplified approach to Oronasal Fistula Repair. Vest a K9 is July 18, 2015 at Milwaukee Emergency Center for Animals. Animal Dentistry and Oral Surgery Specialists, LLC will be there! You should be there as well. Animal Dentistry and Oral Surgery Specialists were a Sponsor for a CE program for Milwaukee Veterinary medical Association Endocrinology lecture by Dr. Bret Nichols: Atypical Cushings, Is it Really Atypical? March 24, 2015. Crown Plaza Hotel. CE Credits through the Milwaukee veterinary medical Association. April 12 & 13, 2014 Northeastern Wisconsin Dentistry CE weekend: Drs. Brook Niemiec, Dale Kressin, Steve Honzelka, Joey Buhta and Katie Kangas. This continuing education is RACE approved for licensure credit. March 11, 2014 Dr. Kressin is a sponsor for the Milwaukee Veterinary Medical Association Meeting Speaker Shaun McVey for Milwaukee ER for Animals. February 15-19, 2014 Western States 87th Annual Veterinary Conference: Dr. Kressin is teaching 8 hours to Veterinarians for CE on Dental extractions in cats and dogs. Dr. Kressin and Dr. Joey Buhta teach regional anesthesia in conjunction with Animal Health International and Dr. Brook Niemiec of DogBeachDentistry. September 22, 2013 at Globe University near Minneapolis, Mn. Dr. Kressin and the Animal Dentistry and Oral Surgery Specialists, LLC with the Milwaukee Emergency Center for Animals & MVMA Present: Stages of Growth in an Entrepreneurial Business. WVTA Dental Extravaganza Dr. Kressin is proud to work with the Wisconsin veterinary technicians. Dr. Honzelka represented Animal Dentistry and Oral Surgery Specialists, LLC as he presented a regional anesthesia lecture and laboratory for the Wisconsin Veterinary Technician Association February 9, 2013 in the Wausau area. Argosy University: Twin Cities Dr. Kressin is working with Dr. Brook Niemiec and running a rountable on "Regional Anesthesia". This is in conjunction with a full day teaching laboratory for veterinarians and technicians on Dec 1 & 2, 2012. Northeastern Wisconsin Veterinary Medical Association Dr. Kressin is speaking on "Beyond cleaning and extractions" as well as providing continuing education at The Marq, in DePere November 28, 2012. 26th Annual Dental Forum Drs. Kressin and Honzelka will present a laboratory that will cover surgical extraction of many different commonly extracted teeth in the dog. A focus will be on appropriate flap design and exposure. November 8-11, 2012 in Seattle, WA. Wisconsin Veterinary Technian Association Dr. Kressin was the keynote speaker for the 2012 WVTA confrence in Madison October 12, 2012. Milwaukee Pugfest Animal Dentistry and Oral Surgery Specialists enjoyed a fun and successful day of exams and consults with Pug owners, May 20, 2012. Swing into Spring Seminar for Milwaukee area veterinarians: Dr. Kressin provided continuing education for veterinarians April 28, 2012. WBAY Green Bay pet expo Dr. Kressin and his wife Joann enjoyed a day of fun and fur at the Green Bay Pet Expo March 23-25 2012. Great Lakes Pet Expo February 2012 Drs. Kressin and Honzelka were helping companion animal owners with dentistry and oral surgery related questions. Janurary 2012 is not only the beginning of a new year, we have created new associations and a new location. The Animal Emergency and Specialty Services business was purchased by Lakeshore Specialists as Dr. Kirby has decided to retire. We will continue to offer services at 2100 W. Silver Spring Drive location in Glendale. We will also be scheduling appointments at the Milwaukee Emergency Center for Animals at 3670 South 108th Street in Greenfield, Wisconsin 53228. Dr. Kressin is providing a continuing education presentation for veterinarians and technicians in Wausau, Wisconsin on November 30, 2011 for the Northern Wisconsin Veterinary Medical Association. 25 th Annual Veterinary Dental Forum: Drs Honzelka and Kressin are providing continuing education for veterinarians in Boston November 10th -13th, 2011. NEW Zoo Drs. Kressin, Honzelka, Gilbert Grey and Bellin work as a team on Dave, a 7 yr old moose. Dr. Kressin performed a surgical root canal with Dr. Honzelka. Milwaukee Veterinary Medical Association February 8, 2011 presentation is "focus on Endodontics" for veterinarians and technicians! Veterinarians may make their requests for topics they have interest to hear about. This presentation is at 7:00 PM at the Milwaukee Humane Society. Great Lakes Pet Expo 2011 will be held at the Wisconsin States Fair Grounds on Saturday February 5, 2011. Dr. Kressin will be giving a public presentation on the "myths and common misconceptions" about veterinary dentistry. The Presentation will be at noon and Dr. Kressin will be available for the entire event to answer dental and oral surgery questions. NEW Zoo will be the location of a fall seminar for veterinarians and for the general public interested in exotic animal and zoo animal dentistry. Dr. Kressin and Dr. Peter emily will provide a two hour presentation on November 6, 2010 from 1:30-3:30 PM. The public is welcome and encouraged to attend this event. The Northeastern Veterinary Medical Association has sponsored this presentation. Dr. Kressin is providing continuing education education for Rock Valley Veterinary Medical Association in Southern Wisconsin on April 11, 2011 at the HHFFRRRGGH Inn, 731 South Wurthering Hills Drive, Janesville, Wi 53546. 24th Annual Dental Forum is September 30-Oct 3, 2010. Drs. Honzelka and Kressin will be presenting case reports and teaching veterinarians oral surgery. 10th Annual Door County Scotty Rally 2010 is May 21-22, 2010. The Animal Dentistry and Oral Surgery Specialists, LLC will be there to support this rally. Oral examinations will be provided and dental consultations provided to benefit Scotties and their friends that come to this wonderful event. Milwaukee Pugfest 2010 is May 16, 2010. This a very well attrended event. Dr. Kressin and the Animal Dentistry and Oral Surgery Specialists, LLC will be there to support the event. Dr. Kressin will provide a presentation on oral and dental health with discussion of cleft palate. Oral examinations and dental consultations will be provided to screen Pug companions for oral and dental health. Spring into Summer 2010 is a continuing education event for Milwaukee area veterinarians sponsored by the Milwaukee Veterinary Medical Association and the Animal Emergency Center and Specialty Services. The event will be held at the Radisson hotel in Wauwatosa on April 24, 2010. Dr. Kressin is excited to present information on oral surgery. Eden Prarie, Minnesota is our newest location and services begin May 24, 2010. It is exciting joining the community and the association of Minneaspolis & St Paul metropolitan area veterinarians. Dr. Kressin enjoys sharing the passion for dentistry and oral surgery! Green Bay Pet Expo is March 26-28, 2010. The Animal Dentistry and Oral Surgery Specialists, LLC will be there for you! SAVMA Symposium is March 11-13 2010. Drs. Honzelka and Kressin assist a group of veterinarians from Illinois, Missouri and Wisconsin to teach veterinary dental radiology and oral surgery to students from accrfoss the USA. Arrowhead Veterinary Medical Association Meeting- December 5, 2010; 8AM to 5PM at the Radisson Hotel in Duluth, Mn. Dr. Kressin will present eight hours of practical aspects of veterinary dentistry and oral surgery. Dentistry Seminar for Veterinarians: Patterson, a human dentistry supplier and Webster, a veterinary products distributor has developed a training facility for area veterinarians. On February 13, 2010, Dr. Kressin presents and provides a workshop on dental radiology and dental radiograph interpretation as part of this event. Great Lakes Pet Expo Milwaukee is an event dedicated to special companion animals and an exciting event for Dr. Kressin. Dr. Kressin's presentation is to imform animal owners about periodontal disease with emphasis on the fact is that owners can make a difference for their pets. This is the Animal Dentistry and Oral Surgery Specialists, LLC; fourth consecutive year participation. Our message is that we care about owners, their veterinarians and wellness for companion animals. Arrowhead Minnesota Veterinary Medical Assiciation provides continuing education for Minnesota and Wisconsin veterinarians. Dr. Kressin presents clinical updates in veterinary dentistry and oral surgery. This full day seminar is on December 5, 2009 at the Radisson Hotel in Duluth, Minnesota. 2009 Veterinary Dental Forum- October 29-November 1, 2009. Dr. Kressin will participate with an oral surgery 2-hour presentation. Dr. Kressin has participated in the Annual Veterinary Dental Forum since 1995. This is an opportunity for veterinarians to learn new information and to improve skills essential to provide verteinary dentistry and oral surgery services. Wisconsin Humane Society Education: September 24, 2009. Dr. Honzelka will present useful information on periodontal disease. A demonstration on teeth brushing will be provided and we ask you to bring your questions.XVIII European Congress of Veterinary Dentistry: September 12-14, 2009. Dr. Kressin will be participating with three oral surgery presentations of clinical cases on jaw fractures, palatal surgey and oral surgery principles. 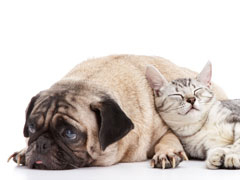 Wisconsin Humane Society Education: June 23, 2009 6-7PM Dr. Kressin will discuss periodontal disease and steps pet owners can take to prevent or control it. Animal Emergency Center and Specialty Services - June 14, 2009. Radison Hotel Milwaukee. Dr. Kressin is presenting useful clinical tips for oral biopsy and oral surgery. Please don't forget to keep an eye on the teeth. We never want to loose focus on dental and oral health care! This is wonderful event held in Bailey's Harbor. Dr. Kressin will be screening pets for oral health. Dr. Kressin is a featured speaker and is offering a hands on laboratory training session for veterinarians at the University of Wisconsin College of Veterinary Medicine.